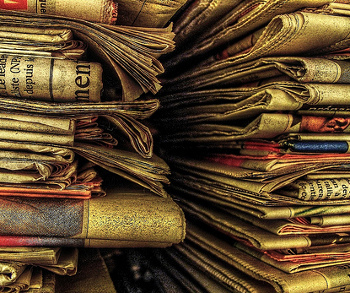 Newspapers are in trouble and paywalls have (so far) been a flop. While some people say this heralds the end of ‘real journalism’, maybe newspaper websites just need a rethink. Perhaps they could really learn something from blogs. Figures leaked to Beehive City this weekend point to a slow start for Rupert Murdoch’s Times paywall in the UK. Meanwhile, another story at the Guardian talks about how rival newspaper the Daily Mail’s website is well on its way to turning a profit without a paywall in sight. It’s also the most viewed newspaper site in the UK. How does it achieve this? I’d say it’s by being more like a blog than an actual newspaper. Different headlines from the paper version. MailOnline opts for the kinds of stories that might not be the ‘biggest’ of the day, but that will get people talking and sharing. In this case, a story with shock value. Celebrities. MailOnline is heavy on celebrities fluff stories because they’re a big draw. While they wouldn’t work so well in the paper version, online you can pump out these types of posts quickly and generate lots of traffic with relatively little effort. Lots of images. Many newspaper websites try to recreate the look of an actual newspaper. MailOnline forgoes that with images strewn all over the place, giving it more of a ‘magazine’ feel. ‘Talking points’ work well online. “Man ordered to pay £1,500 after being found guilty of drowning a squirrel” is the kind of story you might see on a Gawker Media blog. It may be a serious story about animal cruelty but as we said in point 1, it’s a ‘talking point’ story. It may only warrant a small mention in a print newspaper but it gets frontpage treatment here because MailOnline knows that web users have very different priorities. Different editorial staff. Most newspapers’ staff work across print and web. Not at the Mail, here it’s two separate teams. This is important because web writing is very different to writing for print. Web articles generally work better when short and concise while print articles can spend longer ‘telling a story’. Many successful blogs follow the guidelines above, albeit tweaked as necessary. Technology bloggers know that Twitter and Facebook are their ‘celebrities’ that drive lots of traffic, which is why you’ll see lots of mentions of those companies on tech blogs; just as celebrity blogs will mention people like Justin Beiber a lot – he drives traffic. Can newspapers be more like blogs without losing their ‘quality’? The Daily Mail is a tabloid and doesn’t have to worry too much about losing a ‘quality journalism’ reputation by changing its output for the web. How about those newspapers often seen as ‘high quality’ news outlets? In those cases, they could probably drive more traffic, get more advertising and avoid the threat of a paywall by simply tweaking their output for the web. Include more internal links. This common tactic by blogs links within the text of a story back to relevant news from the past, thus driving more pageviews. Use Retweetable headlines. As we’ve noted before, Twitter is hugely important for blogs. By carefully crafting headlines that beg to be retweeted you’re increasing the chance of a hit story. Write short, concise stories. Not everyone has time to read a 2500 word interview. It could be summarised in a 500 word ‘blog post’ style piece, highlighting the key, newsworthy points – perhaps with a link to the full thing for people suitably interested. Know their ‘celebrities’. As I noted above, the ‘celebrities’ of tech blogs are currently Twitter and Facebook; stories about them drive traffic. Newspapers need to know their ‘celebrities’. Boosting traffic without losing site of what makes a newspaper unique is a difficult balancing act, but I can’t help thinking some newspapers could prosper by ‘thinking web’ before they ‘think paywall’. Read next: You wouldn't believe what Internet Explorer does to your girl!